Exploring the outdoors on a hike with young girls is an amazing experience. The sound of wind in the trees, the smell of dirt beneath boots, a chipmunk scurrying for cover as six girls give chase-these are the moments that build lifelong memories. But sometimes on a long trail nature needs a little help to keep the “are we there yet?” or “I’m bored” comments at bay. To make hikes an even more fun and engaging experience, so much more than just a walk, here are some of our favorite activities and games that’ll keep girls occupied as they mosey down the trail. ABC Hike: particularly useful for Daisies or young hikers, ask girls to start at the beginning of the alphabet and identify something on the trail that begins with “A” then work through all the letters in the alphabet. If girls get stuck on a hard letter (like X or Z) see if they can find trees whose trunks make an X or sticks that fell in a Z pattern. Nature Detective: turn the girls into amateur sleuths by asking them to find a strange geological or biological feature (tree bending around another tree, a rock shaped like a face, or a cave-like rotting log). Have them approach it, touch it, and see if they can figure out what it is or why it is as it is. This is a quick activity to get girls to engage their reasoning skills as they use as many of the senses as possible for investigating the world around them. Many trail maps have fun names for these odd formations like the Devil’s Bathtub at Hocking Hills State Park but if they don’t, the girls can always make up their own nickname too. 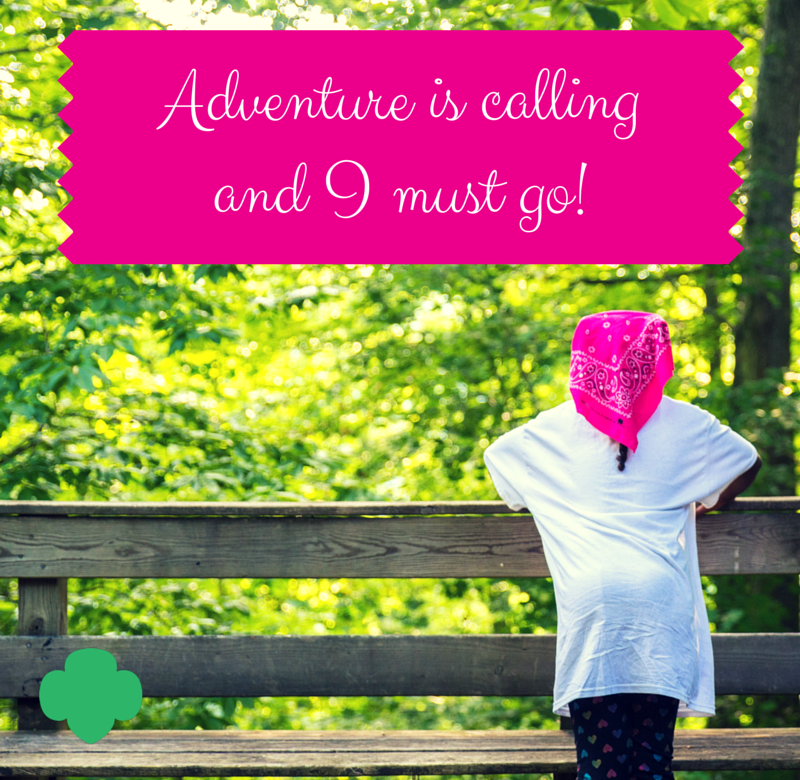 The Never Ending Story: help girls create a unique story as they hike. One person begins to tell a story and then passes it along to another person to continue the plot and so on. The rules can vary, with one version where each girl gets to add one sentence to the story or another where a girl must stop in mid-sentence and another girl has to finish the sentence. This is a great way to keep groups of girls hiking together, laughing, and being creative. Plus the stories are always hilarious! Scavenger Hunt: this one can be planned ahead where girls get a list of things to find (but not always keep) as they begin the hike or the leader can keep it as a back up for when energy starts to lag. The directions can be as simple as challenging the girls to find things that are fuzzy, small, rough, bumpy, smooth, big, soft, sticky, squishy, lumpy, wet, living, growing, round, triangular, moving, make noise, hard, smelly, etc. Or if the leader is familiar with the trail she can make a list of landmarks on the trail itself. Rainbow Colors: ask girls to try to identify things along the trail by the colors of the rainbow. Once the girls start looking closely for each color they’ll be amazed at how many colors are found in nature. Blindfold Hike: a more challenging idea for older girls this activity has the girls pair off. The first girl will be blindfolded (to explore and discover things in a new manner) and the other will be the guide (responsible for the safety of the blindfolded person). Lead the group over different types of terrain asking girls to guess where they are going. Have them study a tree and tell all they can about it by using all their senses but sight, or ask them which direction they are traveling. Have the girls switch roles. Best on a well-maintained trail where the leader is familiar with upcoming obstacles and hazards. Night Hike: if your girls are masters of day time hiking, change it up by taking them on a favorite trail after dark. For a first try pick a night with some natural light from the moon, leave the flashlights at home (they destroy night vision), and learn to see the world through night’s eyes! If you’re still a bit nervous about trekking off with your troop or want a guide for your first hike, contact your local parks department to see if they have guided hikes coming up soon. Or come out to one of our properties for a program event like Junior-Habitat Exploring, Adventuring with Maps-Brownie/CSA/Junior or Brownie Hiker and explore with us. What are you waiting for? Tuck a few of these ideas into your backpack and turn a walk into an outdoor adventure!